Coffee...you either love it or hate it. I finally began enjoying coffee when I was in my first year of teaching third grade. It was the only thing to drink in the teacher's lounge. I loaded it up with cream. (My husband drinks his that way) and it was palatable. The hot drink went well with my bologna sandwich. I now enjoy coffee. (But it is so much more enjoyable with a hunk of chocolate cake). The caffeine gives me a pop in the morning. By mid-afternoon I NEED a hit of caffeine again. Sigh...How about you? 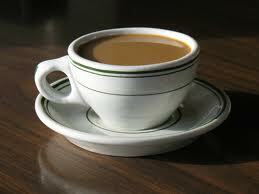 I enjoy it the most when sitting with friends and sharing in coversation over a hot steaming, creamy cup of Java. On How Stuff Works, a TV program, I learned all about coffee, espresso, and poop coffee. Yep. A weasel-like animal in Columbia eats the coffee bean and then poops it out. The feces is gathered, and CLEANED, and made into coffee for $400 a pound!! I can just picture people following the weasel through the jungle with a pooper-scooper like the folks who follow the horses in parades down Main St. No wonder this is expensive coffee. You'd have to pay someone a lot of money to do this!! Are you a coffee drinker? If so, why? If not, why not? Leave a comment to let us know. Just for fun, vote in the coffee poll in the sidebar at the right. Thanks! Yeah, I've always loved that $400.00 a pound coffee story! They'd have to sneak it to me to get it to drink it, just the thought turns me off. I'm a coffee addict. Don't remember, even as a child, not drinking coffee. Had a white mug with a little blue bear. Of course, then it was with cream and sugar. That's long since departed, I drink it straight! (And I got really hooked when the kids were little because coffee was furnished by the firms in the breakroom and I honestly didn't have the spare change to buy a coke! I am a card carrying tea drinker, JQ. None of that herb stuff. Nice black Assam tea imported from Ireland, good stuff. I drank coffee for a while a long time ago but it made my hands shake and I got headaches if I went without it. I don't hate it, I just prefer my tea, especially after reading your post :-) Off to Put the Kettle On! LMAO!!! Poop coffee. Can you imagine the early pioneers of that idea? Goodness JQ. You crack me up. Thanks for the info. I'm sure it will be a great ice breaker of conversation tool. Pat, I agree with you. I really do like tea better and it doesn't have so much acid. There are so many delicious teas. I just like my coffee, plain old Folgers with a little milk/cream..no flavors. Yes, please put the kettle on and I'll be right over! Karen, it may be a great ice breaker if your guests can stand the smell and they actually stay for coffee!! Hey, that would be a great scene in a book, eh? I didn't start drinking coffee until my late 30's. It was out of necessity, really. I needed to be able to stay awake so I could work on my book after I put my kiddos to bed. Now, I can't write without it! Doesn't matter what time of the day it is. It's just part of my writing ritual...that and nibbling on chocolate, of course! I like flavored coffee and iced coffee, but right now I'm more of a tea drinker. Especially chai tea. Yumm! $400 poop coffee? No thanks!